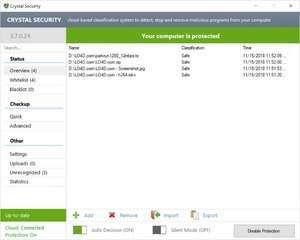 Crystal Security is an alternative program to some of the more well-known antivirus programs specifically created for combating spyware, malware and other common nasties distributed on the Internet. As a portable application, Crystal Security is capable of being run from a USB drive so no installation is necessary. The actual program is cloud-based and its executable uses little in terms of system resources making it a suitable application for systems running slow due to malware. Crystal Security enabled rapid detection and removal of malicious programs from your computer. Version 3.7.0.39 is a freeware program which does not have restrictions and it's free so it doesn't cost anything. For security reasons, you should also check out the Crystal Security download at LO4D.com which includes virus and malware tests. Additional screenshots of this application download may be available, too. 3.8 out of 5 based on 13 ratings.